Sony has a very successful CES as they introduced a whole bunch of new devices and services like 4K TVs, Xperia Z1 Compact smartphone or PlayStation Now. They are all great products, however, I’m impressed the most with their Demo room of Life Space UX project. In the booth, Sony demonstrated its vision for future home displays, specifically its new projectors. 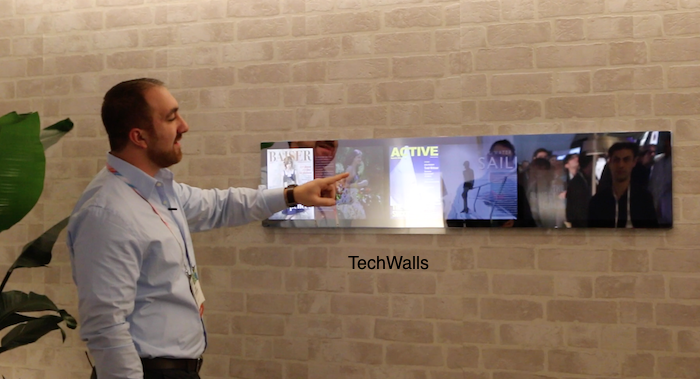 We walked into a small room where they showed off a series of new products, including the Sony’s 4K Ultra Short Throw Projector, Interactive Laser Projector, Ceiling Light Projector and Touchable Mirror. Check out the demo video below. The most prominent product in the demo is the Sony’s 4K Ultra Short Throw Projector. The expensive projector will cost around $30,000 to $40,000 and launch in late Summer 2014. The image quality of the 4K projector is unbelievable, the color is not washed out like others and sometimes I feel like I am watching on a huge 4K TV. The projector is equipped with SXRD panel and laser light source, they help deliver a very sharp and bright image even when the light is on. The projector sits very close to the wall and it could cast a 147-inch image on the wall. Now, there is nothing can interfere with the projection. I also really like the whole design, all components are made of aluminum and you can see it looks so luxurious in your living room. The projector includes 2 cabinets, 2 speakers and the projector unit at the center that could open or close automatically. The Touchable Mirror looks just like a long conventional mirror mounted onto the wall, however, it is actually a touch screen that will turn on when someone approaches. Here you will be able to get access to digital magazines and other content, so you can read articles or watch videos when you are in the kitchen, or brush your teeth for example. On the ceiling, we can see there are two lights, which actually are short throw projectors that shot upwards to the ceiling. In the demo, it is used to add extra ambience of outside sky and underwater effect. The speakers are also attached everywhere to create an immersive surround sound. Regarding to the Interactive Laser Projector, the idea of projecting from kitchen lamp to the tabletop and interacting on the table seems interesting as we can use drag and drop gesture to access widgets, browse photos, watch the news, check calendar or leave a note. However, it is very annoying when the interface is not really responsive and our hands always block the light from projector. Sony is bringing very neat ideas to life and they are blending easily to our furniture and interior design. We are expecting their launches soon this year. If you are interested in the new home theater system, make sure to prepare your pocket.